If you work at a desk, your world is very small for most of the day. It may extend as far as a file cabinet or the water fountain around the corner, but it unquestionably centers around the area within reach of your office chair. (Or anti-fatigue mat, if you work standing.) Since this area is limited by the length of your arms, it tends to be quite small no matter how large your office. Every square centimeter should be used optimally. This is especially true of the all-important spot beneath your dominant hand – a spot which is usually devoted to your ergonomic mouse. Take a moment to look at your computer mouse. How big is it? How much space does it require to move? Does that leave enough room for your dominant hand to reach anything else, such as a notepad? Most mice are larger than necessary, and “ergonomic” mice tend to be even more so. An average computer mouse measures about 8-10cm long by 6-7cm wide. One leading vertical mouse covers an area 11cm by 8cm. It, in turn, is dwarfed by another popular non-vertical “ergonomic” design. These larger, hand-encompassing mice are usually “slower” as well, requiring more physical movement to get your pointer across the screen. Such a large, slow mouse can end up consuming a fifth or even a fourth of the prime working space directly in front of you, and virtually all the space easily reached by your dominant hand. 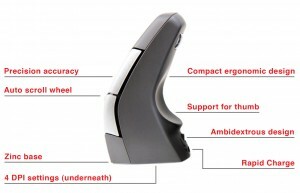 The footprint of the DXT ergonomic mouse is 5.5cm by 4.5cm – an area less than one-third that of the vertical mouse mentioned earlier, and under half of a small standard-variety mouse. The DXT is also very “fast,” with a top hardware speed setting over 2000 DPI. Because of its compact, pen-like design, perfect control can be maintained at high speeds and in a very small space. Having things within reach is an important element of good ergonomics. You might have the most “ergonomic” mouse and keyboard, but if you’re leaning halfway across your desk all day to reach your phone or notebook, you could be asking for other problems. Consider trying the DXT Ergonomic Mouse – precision and comfort in a package small and fast enough to win your own individual Space Race.